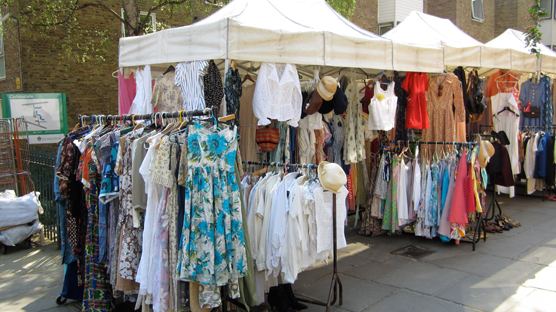 Every Wednesday and Saturday the little lanes around Camden Passage play host to a select number of second hand stalls. 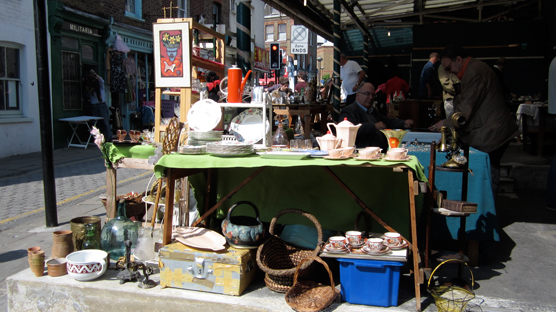 It's like a little slice of Parisian flea market charm unfolds on the back streets of Islington. Next time you’re in Islington, ditch Upper street and seek out Pierrepont Arcade. 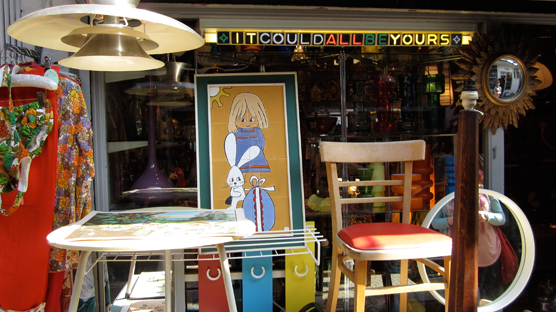 It’s home to about 20 miniature units which sell everything from tea crockery, clothes, accessories, midcentury furniture, costume jewellery, bric-a-brac, old photos – everything you’d dream a Parisian flea market would be full of. Odyssey, run by the charming Paul is my favourite unit. He specialises in Scandinavian homewares and lighting and sources a lot of this stock from Ardingly Antiques Fair. On spotting my owl necklace he coyly admitted to having a thing for owls and told me it showed wisdom. Good man. Row of stalls on the corner of Charlton Place and Camden Passage. Just outside the arcade is a little raised platform with another bunch of stalls which mostly specialise in vintage French Kitchenalia. I’ll happily refrain from ever using the term “shabby chic”. Cloud Cuckoo Land, Charlton Place, Islington. 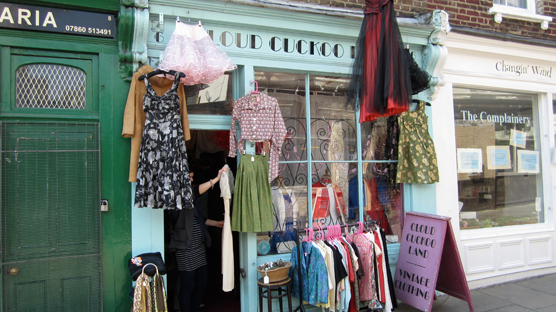 Opposite you’ll find one of my all time favourite Vintage clothing shops – Cloud Cuckoo Land. They have a top notch selection of proper vintage dresses mainly 20’s to 70’s. My thrifter’s tip for this store is to go right through to the little back room next to the changing rooms where there’s a permanent sale rail. A good’un it is too. Pretty stalls along Camden Passage. Back onto Camden Passage itself are a row of white stalls full of the prettiest second hand clothes and accessories. The last two stalls pictured above are my favourite and run by a lovely lady called Sarah. Child’s neckerchief made using the devore technique. Her pieces have a distinctly French feel and on the day of my visit she was unpacking a huge suitcase full of pieces she’d bought from a buying trip in France. 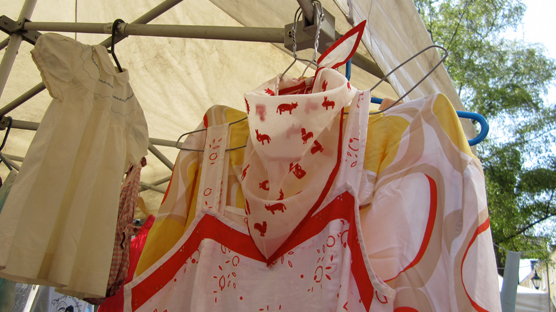 I tried on this sweet child’s neckerchief with little cherry red animals dotted all over it. She happily stood and chatted to me about how it would have been made using a devore technique. I don’t often find vintage traders so happy to chew the fat. It’s refreshing and makes me want/happy to spend my pennies. A wall of beautiful mirrors. 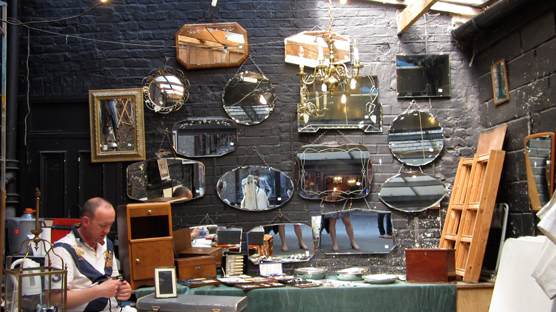 Walk further along Camden Passage and another cluster of stalls open up which sell costume jewellery and accessories flanked by this stunning wall of mirrors. 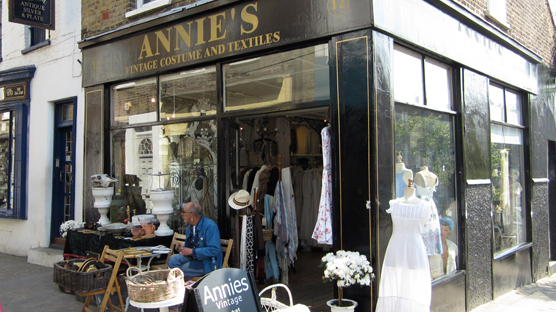 There are two more ah-mazing vintage clothing boutiques called Fat Faced Cat and Annie’s – I always pop into them for inspiration and to see what exists out there in the wonderful world of vintage. I just can’t part with £75 for a pair of 1980’s K Shoes. The Breakfast Club, Camden Passage, Islington. 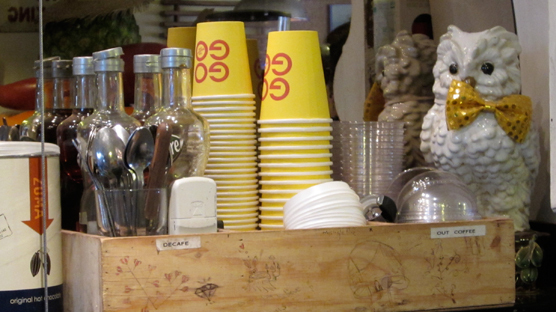 After all that sifting ‘n’ thrifting I recommend a battery charge in The Breakfast Club which not only do great coffee but it’s served to you next to a big owl wearing a bow tie. What more could you ask for? I visited London at the weekend and HAD to explore this place after reading your blog. It’s the most amazing collection of stalls and shops and I ended up spending most of the day there rummaging. Definately worth a visit!